Port truckers continue to ask the city to address alleged labor violations by companies operating at the Port of Long Beach. The Long Beach City Council again forwarded instructions to the city attorney’s office Tuesday night to explore options for the city to cut down on labor violations at the Port of Long Beach, but gave no timetable for the action. 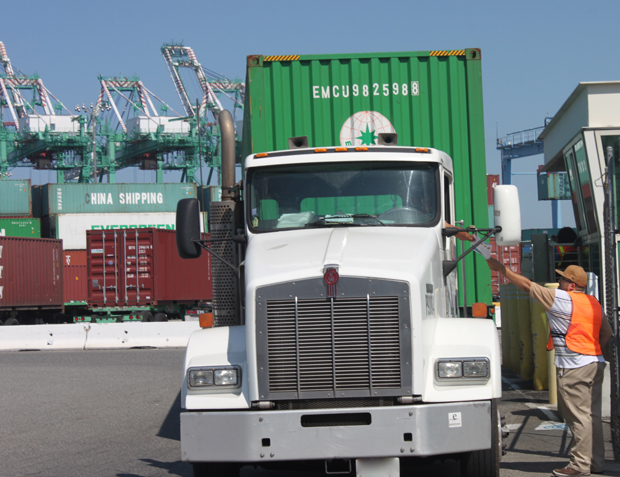 For decades, port truck drivers have been demanding local agencies address wage theft and misclassification of workers at the ports of Los Angeles and Long Beach. The practice, employed by some trucking companies, classifies drivers as independent contractors instead of employees, which has led some drivers to end up owing money to their employers at the end of the week. The issue was explored in depth in a series by USA Today in 2017, which detailed truckers working to the point of exhaustion only to bring home little to no money. Port truck drivers have staged over a dozen strikes in the past five years and have flooded the council chambers a number of times to bring attention to the issue. The City Council initially voted in February for the city attorney to support statewide and federal legislation aimed at addressing misclassification and wage theft at the port and to have its own attorney work with local and state agencies to seek out options for local enforcement. That vote came a month after the Los Angeles city attorney announced the city was suing a number of trucking companies at the Port of Los Angeles for misclassification of drivers. The suit seeks to end the practice of misclassification stating that because the violating companies exert near full control over truck drivers they should be classified and treated as regular employees. Since February the city’s harbor and tidelands committee as well as its harbor commission has held hearings on the issue. While the council again expressed outrage at the reported working conditions for some port truck drivers, it provided little in terms of concrete ideas for a solution or a window in which the city could provide relief for truckers working under these conditions in Long Beach. Austin said that the council may need to seek federal intervention to address the issue at the city’s port. Federal legislation was introduced last October by Congressional Democrats seeking to stop wage theft at the nation’s ports but the bill has yet to advance past the committee stage. However, last month Gov. Jerry Brown signed into law a bill that makes retailers who knowingly partner with trucking companies with unresolved labor judgments liable for civil or legal damages. Senate Bill 1402 was authored by State Sen. Ricardo Lara who represents parts of Long Beach and requires a list of violating trucking companies to be published and for retailers who employ any company on that list to share the legal burden with those companies if they’re sued in the future. The latter could provide incentive for trucking companies to convert to an employee model as it puts legal pressure on retailers to avoid doing business with those who have been penalized or could be in the future. Retailers like Target and other trucking and logistic companies who work at the port have submitted letters supporting the city’s pursuit of regulations that could curtail the practice of misclassifying drivers and potentially even the playing field for other companies already operating under the driver-employee model.